I have mixed thoughts on Django Unchained. On on hand Quentin Tarantino’s take at a spaghetti western (although set in the south of America making a southern) Opening up to the theme from the 1966 Italian western Django by Roberto Fia, it nods at the source witch inspired it while tuckering the issue of slavery. As you’d expect with a new Tarantino movie, it is largely enjoyable with its snappy dialogue, over the top violence, larger than life characters and a soundtrack made up of old school and contemporary records. One the other hand however, it is way too long and is a key example of a film maker in love with his own work. Set in 1852, two years before the American civil war when slavery was legal, Jamie Foxx plays Django, a slave who’s been separated from his wife Broomhilda (Kerry Washington). Christoph Waltz’s Dr King Schultz, a bounty hunter who needs Django to identify three brothers wanted for murder, frees him and in return he will help find and reunite him with Broomhilda, who is at a plantation called Candyland owned by Calvin Candie (leonardo Dicaprio), a slave owner who forces his male slaves to fight to the death for money in a Mandingo fighting ring. The due hatch a convoluted plan and pose as potential buyers of a fighter wile offering to purchase Broomhilda in the process. The fIlms running length is an issue, as the story does feel stretched out with its own ideas (do we really need the german legend of Brunhilde/Broomhilda explained to us) Particularly in the middle section where our heroes take the journey to Candyland. This is mainly down to the script as it does seem that some trimming needed doing in the writing process. As the peace fits together as a whole but takes too long to do so as there are scenes that justifies one plot point at a time which bogs the film down from what it could have been an easy 2 hour flick. 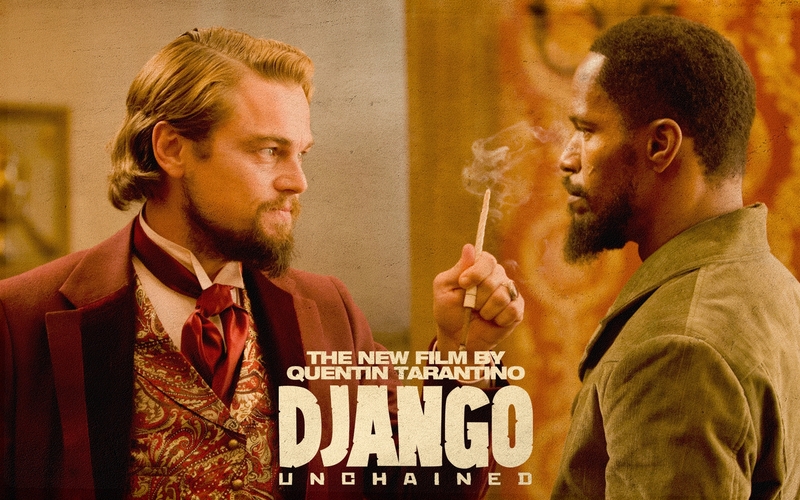 The use Despite the length and the pacing issues, Django Unchained is an enjoyable experience, just a drawn out one.. This entry was posted in Uncategorized and tagged blood, Christoph Waltz, django unchained, Jamie Foxx, Kerry Washington, Leonardo DiCaprio, Quentin Tarantino, Samuel L. Jackson, southern, western by Chris. Bookmark the permalink.